Once it was a fortress temple for the paladins of Marr, but only evil now lurks in Befallen. A primal, nameless evil that calls to it own, bringing Norrath's most fiendish villains to its depths - only to rob them of their sanity and add their malevolence to its own growing power. How long will this accursed place throw its shadow over the Commonlands? How long until heroes rise to the challenge of redeeming these once holy grounds? 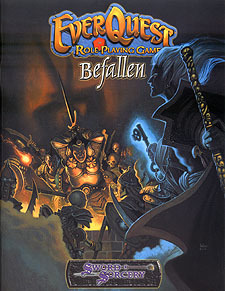 A campaign adventure for the EverQuest Role-Playing Game or any 3rd Edition fantasy game with challenges appropriate for characters levels 4 to 15.